It is only recently that I began reading the Ransom Riggs Miss Peregrine's Home for Peculiar Children series, but once I started I easily knocked out the first two books in one day. 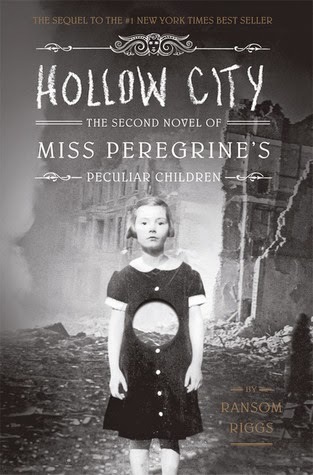 The second novel in the series, Hollow City continues immediately where the first novel ends--with the peculiar children of the Cairnholm time loop fleeing from the hollowgasts, while searching for a way to restore their guardian, Miss Peregrine, back to her human form. While the use of time travel was introduced in the first novel, it is a much more reinforced idea Hollow City. In Miss Peregrine's Home for Peculiar Children, the protagonist Jacob is taught how to travel effortlessly between his own timeline and a day during the second World War that continuously loops back each night--thus the people within the loop relive the same day repeatedly. However, in Hollow City, this time loop is nonexistent, and Jacob decides to remain in the past in order to help the peculiar children evade the monsters perusing them. Now the element of time travel is reinforced as an inescapable reality as Jacob (who is from the future) and the peculiar children (who have been reliving the same day for decades) find themselves navigating a time with which they are all unfamiliar; all the while evading, not only the monsters bent on their destruction, but also the perils of WWII unfolding around them. What I liked about this novel, moreso than the first novel, was the sense of urgency that infused the storyline. While Miss Peregrine's Home... sets up for an adventuresome story, Hollow City takes that setup and runs wild with it. With the continuing inclusion of actual B&W photographs of unexplained subjects, and a "supernatural but still in a recognizable time" theme, this is definitely a series I want to continue to read when the third installment is published in September.